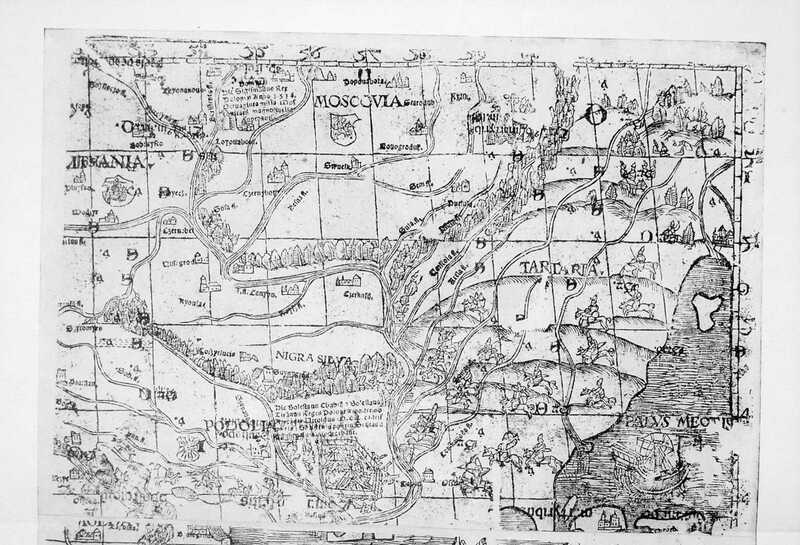 Fragments of the map of South Sarmatia by Bernard Wapowski, created approximately in 1528, comprised parts of the territory of Eastern Europe and Asia (Anatolian peninsula). These fragments were found in 1932 and lost in 1944 (for the history of the map look "The History of Polish Cartography from the 15th to the 18th century" by Karol Buczek. Wroclaw/Warszawa/Krakow, 1966, S. 32). Polish researcher K. Buczek informed about the founding in 1936 , but at first this map was published only in 1966 as the annex to the above-mentioned book "The History of Polish Cartography…"  . Particulary the map of South Sarmatia by Bernard Wapowski was the starting point for the representation of the territory of Ukraine by European cartographers during 130 years, until the appearance of maps by Beauplan. Let's look on the "upper" fragment from two survived fragments of the map (Fig. 1). This fragment include the large part of the territory of Ukraine and the part of lands of Russia and Bilorus. The four parts of the map denoted by the inscriptions LITUANIA, MOSKOVIA, PODOLIA i TARTARIA. On the territoty marked as TARTARIA sketches of nomadic life are depicted and stationary settlements are absent. The exception is Tana/Аzov/Azak (the mark without name in the mouth of the Don River) and Temriuk (Temröch) on the Taman peninsula. As Evliya Çelebi informed, the fortress of Temriuk was founded by Sultan of Ottoman Empire Selim I in 1515-1516 and finished in 1525 by the Sultan Suleiman I . It's appearance on the map approximately after 1526 evidenced that the tactical information about the territories under the control of the Ottoman Empire or Crimea was available to Wapowski . Also we can see Kinski Vody or Konka River (Konskavoda fl.) and the Molochna River (the last without the name on the map). On the lands of the Grand Duchy of Lithuania (LITUANIA region) such toponimes can be read: the Svislach River and the settlement of Svislach (Soyisloczo), Mazyr (Modsyr), Hlusk (Gluysko), Babruysk (Bobruysco), Rečyca (Rzecytsa), Homiel (Homel), Loyova Hora i.e. Loyew (Loyovahora), Chornobyl (Czernobel), Vyshhorod (Vissegrod), Kyiv (Kyovia) settled on the right and left banks of the Dnieper River, the Ros River, Kaniv (Canyov), Cherkasy (Czerkasy). Among them the Dnieper River, Kyiv, Kaniv and Cherkasy were shown on the maps before, all the other objects were shown for the first time. The settlement between Swislach, Rečyca and Homiel remains unidentified (Fig. 2). Alexandrowicz read this name as Tajmanow (Tayonanoua) , Bagrow as Tajona noja , but there are no data about settlements with similar names in the 16th century. In the MOSCOVIA region there are the settlements Novhorod-Siverskyi (Novogrodus), Chernihiv and for the first time, Popova Hora (Popovahora), Starodub (Starodub), Rylsk (Rylsk), Putyvl (Putivl); the Desna and Seym (Sem fl.) rivers, and the left tributaries of Dnieper Sula (Sula fl. ), Psel (Psiola fl. ), Vorskla (Vorskola fl. ), Oril (Arela fl. ), Samara (Samara fl.). The settlement being approximately on the place of the present village of Sosnytsia, Chernihiv oblast (region) of Ukraine, is unidentified (Fig.3). Leo Bagrow has read this name as Swest  but there is no information about the real place with this name. From the location of the inscription PODOLIA it can be concluded that the cartographer used this name for the large part of the Right-Bank Ukraine. This territory condidionally began at the south from the Tiasmyn river (the river without name shown under Nigra Silva – The Black Forest). The town of Bratslav (Braslav) was depicted, and, for the first time, the Tiligul lake (without name on the map), Ustie (Uczye) and Orhei (indecipherable inscription lower than Ustie) on the right bank of the Dniester River. There is a visible “corridor” between the Dniester and Savranka rivers on which the army moved to the lower reaches of Dnieper. This corridor can be identified with the old trade route that led from Western Europe via Lviv and the divide between the Dniester and the Southern Buh rivers to Dashev (or Daszov, somewhere near Ochakiv). A part of this route on the lands of present Ukraine from the middle of the 16th century is known as Kuchmanskyi shliakh (route). The name of a ruin shown between the Dniester and Savranka rivers can be read with the help of map by Münster, 1540, as Kuchurgan (now a village in the Odesa oblast, Ukraine). The island Tavan on the Dnieper – the well-known place of river-crossing – and the stronghold of Islam Kermen (Osslam) built by the Crimean Khan Mengli Giray in 1504 are shown. There are interesting marks of two fortifications without names on the left bank of the Dnieper River upstream from Tavan. The upper fortification is likely to be the first cartographic designation of the present-day city of Kremenchuk , Ukraine, the lower one is unidentified. Let's return to the Podolia region. The unnamed ruins near the confluence of Syniukha and Buh rivers were mentioned by Marcin Broniowski in Tartariae Descriptio, 1579, as the ruined town Kodyma . In European cartography of the first half of the 16th–17th centuries these ruins as a result of copying coincided with name of Syniukha River (Szynouoda fl. ), which led to appearance on maps of the settlement Synia Woda, that has never really existed . There is a tradition among historians to “bind” all mentions about the Right-Bank settlement named Zvenyhorod in the historical sources of the 14th–16th centuries to the Zvenyhorodka town in Cherkasy oblast, Ukraine. But Zvenyhorod (Suynygrod) on the map by Wapowski was indicated considerably lower than the Tiasmyn River, on this place it was shown on maps until the middle of the 17th century. Zvenyhorodka town in Cherkasy oblast is placed upper the Тiasmyn River and the history of this settlement is documented since the beginning of the 17th century. That’s why the settlement named Suynygrod can also be considered as not identified. This name passed to the European maps of the 16th–17th centuries in the form of Cosidan, Coszidan, Coszidanz. 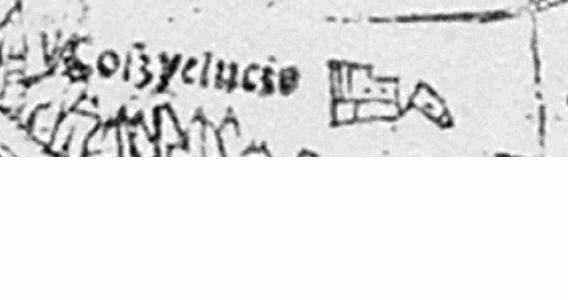 Since there are no historical evidence of the existence of such a settlement, the author revised the reading of this name and made the conclusion that it can be read as Coszyeluczo – Kościelec. But that name is also not found in Podolia and other Right-Bank Ukraine. The name Coszyeluczo could be related to Kościelecki, the representatives of noble family, who held senior positions in the Kingdom of Poland. Their hereditary nest Kościelec is far enough from Ukraine – near Inowroclaw at the center of Poland. At the beginning of XVI century the most known representative of the family was Andrzej Kościelecki, who brought up Beata, the illegitimate child of King Sigismund I, as his own daughter. After the death of Andrzej in 1515 his estates and custody of Beata passed to to his brother Stanisław, the voivode (governor) of Sieradz, Kalysh and Poznań. Stanisław Kościelecki was familiar with representatives of humanitarian Polish elite Piotr Tomicki and Jan Dantishek (Johannes Dantiscus), the latter was a friend of Bernard Wapowski, but nothing is known about communication of Bernard Wapowski with Stanisław Kościelecki. Shortly after creation of the map the destiny of Kościelecki family was united with the lands shown at the map: in 1539 Beata Kościelecka for a short time was the wife of son of Kostiantyn Ostrozkyi (Konstanty Ostrogski), Ilia (Eliasz), who had the title of starosta (governor) of Bratslav and Vinnytsia. It's worthy to note that that on the map of Sarmatia in Roman edition of "Geography" of Ptolemy, 1507, hereditary villages of Bernard Wapowski, Radochońce and Wapowce, were shown by his own initiative. That’s why we can conclude that cartographer could perform a subjective choice of place names to display on maps. We can assume that the indication of Kościelec on the right bank of Dnieper is reflection of some political intrigues or projects of the beginning of the 16th century, unknown nowadays. 1. Buczek К. Les débuts de la cartographie polonaise, de Długosz à Wapowski/ Bulletin International de l’Academie Polonaise, №1-3, z.I-II, Krakow, 1935, S. 9-12. 2. Edition of the map was prepared in: Monumenta Poloniae Cartographica, z.1, Krakow, 1939; tabl. II b, c, but during the war only several copies of it was survived. 3. Эвлия Челеби. Книга путешествия. (Извлечения из сочинения турецкого путешественника ХVII века). Вып. 2. Земли Северного Кавказа, Поволжья и Подонья. М. Наука. 1979. .
4. See T. Gedz. The Crimea on the map of South Sarmatia by Bernard Wapowski . 5. Alexandrowicz St. Rozwój kartografii Wielkiego ksiestwa litewskiego od XV do poiowy XVIII wieku. Рoznan, 1989, S. 45. 6. Багров Л. История русской картографии. Москва, 2005, C. 120. 7. Багров Л. История русской картографии… , C. 122. 8. Buczek K. The History of Polish Cartography from the 15th to the 18th century. WroclawWarszawaKraków, 1966, P. 34–35; Alexandrowicz St. Rozwój kartografii…, S. 47–50. 9. See T. Gedz. Does the "Synja Woda town" really existed?”? . 10. See T. Gedz. To the Question about Existence and Location of the “Steppe” Zvenyhorod .